Bottle gourd or lauki or sorakaya is generally not liked by every one. Though it is not liked by people it has got its own qualities. So to make best use of it, we cook it in different ways. Make not only curry, but also make dal, chutney, roti, and also dosa. Simply soak green gram and along with bottle gourd, green chillies and ginger with added salt grind it to a fine paste. This recipe I got it from my old cook book. Bottle Gourd / Lauki / Sorakaya - 4"
Soak green gram for two hours. Peel skin of bottle gourd and cut it into small pieces. Add soaked green gram, bottle gourd, green chillies and salt in a blender jar. Blend it to make a smooth batter. Heat non stick tawa, pour ladle full of dosa batter. Do not spread it. Add one tsp of oil. Lower the flame, cover it with a lid. Cook for two minutes or till it turn into brown color. Turn it and cook for two more minutes. 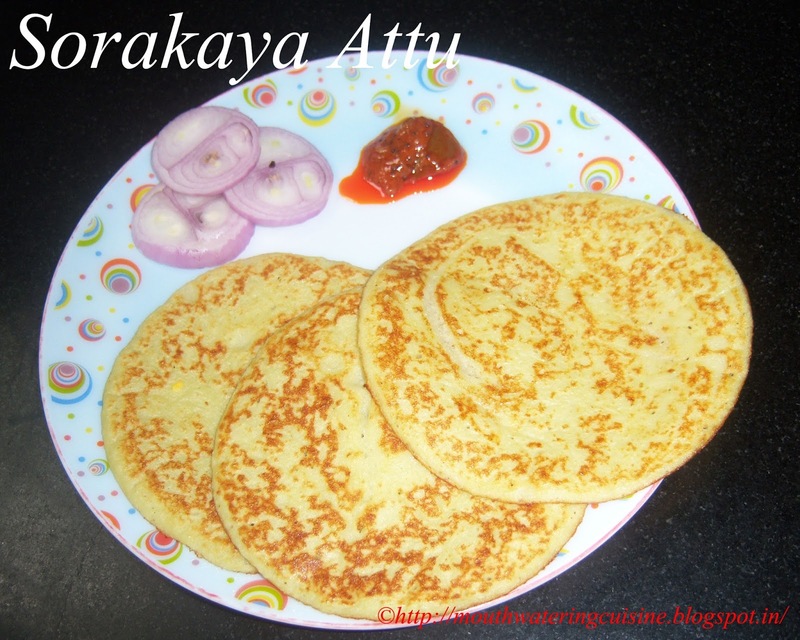 Serve sorakaya attu with any spicy pickle.